On PBS’ To The Contrary With Congresswoman Eleanor Holmes Norton. Last Friday, I was honored to return to PBS’ To The Contrary, the network’s iconic weekly feminist news analysis by and for women. This time, we tackled a host of issues from the 200 girls abducted in Nigeria to campus assault here in the US to feminist men. My main emphasis in all of the issues we tackled was to shift thew blame away from women and stipulate more on how men can help. My emphasis throughout the issues was to shift blame away from women. The issue of feminist men was one I feel quite strongly about, and need to talk about more mainly because I firmly believe that men are our greatest allies. I do think that because of the women’s movement’s focus on the history of our oppression, we unintentionally end up dismissing one of our most important partners- men. The episode covered a lot of issues, even childhood obesity. Watch the special webisode here, and the full show below. Enjoy! 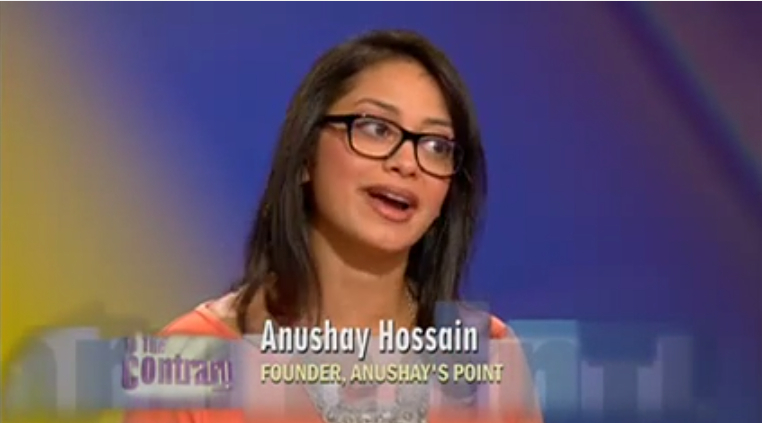 Great work Anushay! You’re right, some of us guys are 100% behind you in support!